Today's ZINspiration comes from Kirsten Vieira of Damascus, MD. She has taught Zumba for about four years. Kirsten volunteers at a local school and her story will inspire all of us to share our Zumba love! Kirsten is in the headlock-esque hug in the middle! My friend Wendy, a fellow ZIN and one of my mentors, taught a Zumba class at our gym that I attended regularly. One day several years ago, some special needs teens from the high school were doing a work project at the gym, and we noticed several of them with their noses pressed against the window watching us. Wendy, being the lovely person that she is, opened the door and invited them to join us! The rest is history. The special education teacher was thrilled with the way the kids responded, and asked us if we would do a class at the school for the whole special education department. We did one, and it was SO MUCH FUN!! We started doing a regular class for them, at the school's request. Many teachers have commented on how the music and dancing have brought the kids out of their shells and have helped them express themselves. It was so amazingly rewarding and exhilarating for both us and the kids! We felt like rock stars whenever we walked into gym as we were greeted with cheers and whoops of joy! It's the most rewarding class that I teach all week. 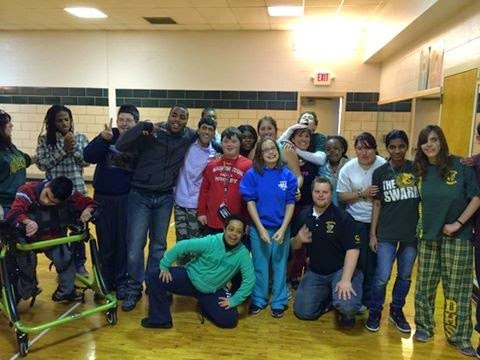 While I love all my classes and Zumba students, there's something unique about teaching people with special needs. I see kids who are non-verbal just light up when the music starts! Teens with down syndrome holding hands and dancing together, a paralyzed boy in a wheelchair grinning from ear to ear as his teacher pushes his chair in time to the music, teens who are overweight and "uncoordinated" experiencing the joy (and health benefits) of movement and music in a safe and positive environment... I could go on and on! The rewards of teaching this class, while not monetary, are far greater than a paycheck. My rewards are the smiles, whoops, high-fives and hugs that I receive at each class.